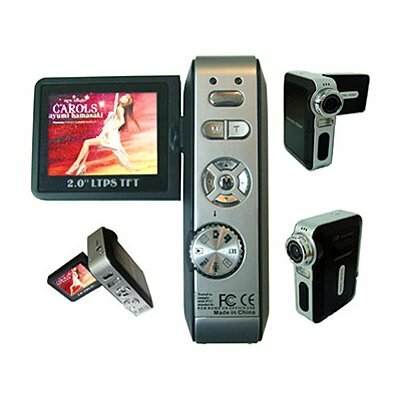 Successfully Added Digital Camcorder, 2.0inch TFT LCD, 10M Pixel, MMC/SD Slot to your Shopping Cart. Chinavasion new wholesale Digital Camcorder with 3.1 Mega pixel CMOS imaging sensor and includes PC camera function. Features high quality Digital Still Image that 10 Mega Pixel, 7 Mega Pixel, 5 Mega Pixel and 3 Mega Pixel and Digital Video Camcorder Resolution is 320x240 pixels 30fps and 640x480 pixels 15fps. It is compatible with 2GB max. SD/MMC card and built-in 16MB flash memory. It is able to 4 x Digital Zoom and connect with computer by USB1.1 PC interface. It needs a rechargeable Li-ion battery to give power supply..